…when you Google “Seventh-day Adventists” or “Who are Adventists,” or other similar search engine queries? 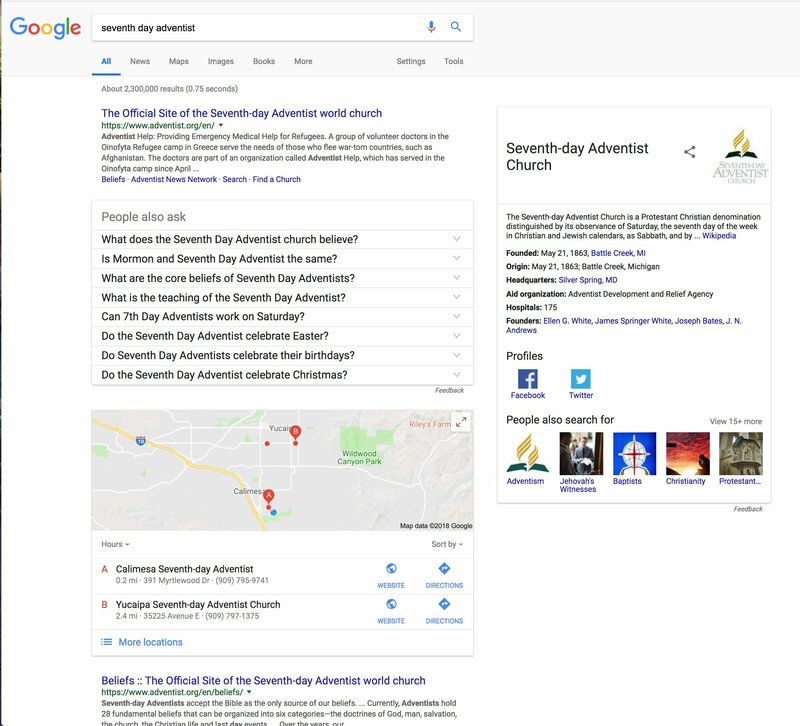 Chances are, since you are already part of the Seventh-day Adventist culture, you will find sites like adventist.org, our wikipedia.org entry, and maybe a few sites you visit often, like your home church or conference website. If you live near a hospital, that could come up, too. This is because Google “knows” you’re an Adventist! Google lists your search results based on your search history, browsing history, and IP address (location data). This is part of how Google’s algorithm tailor-makes its search engine results pages (SERPs) to match individual users’ preferences. Google continually strives to be the most intuitive and useful search engine of all, with the goal to show each user what is most relevant to them. But the SERPs might look completely different to someone googling Adventism for the very first time. A lot depends on the types of content they’ve searched for before. From the numerous stories we’ve heard from evangelists, pastors, laypeople, colporteurs and more (and you’ve probably heard several of your own), these people are finding the questionable content to be far more prominent in their internet searches. As you can see, new googlers of “Adventist” are much more likely to come across some sketchy yet enticing content before they ever come across our official Church content. While this large-scale problem must be mitigated by a large-scale professional effort, there are still several things we can all do to help. Don’t click on the questionable links! If you see a listing in search results that is not from a source you already trust, don’t click on it. Yes, that might seem like a lot to ask, maybe even a little bit silly. But there’s a reason. Every time we click on something from our list of search results, Google takes notice. That’s part of how it determines if a website aptly matches a commonly-used search phrase. If a lot of people click on it, it must be a good fit. If you accidentally do click on one of these, click the “Back” button as soon as you can. Your browser history also tracks how much time you spend on websites after clicking (bounce rate). But if people scroll past those sites and click on other links that are more credible or relevant, Google notices that as well. In this small way, we can each help influence Google on which Adventist links are worth clicks, and which aren’t. Wherever you go online, represent! Remember that how you conduct yourself online, whether as an individual, small group, a church, a school, a ministry, etc., affects the perception of the organization you belong to or the beliefs you claim. Share positive stories! If your church’s youth group volunteers at a homeless shelter, take pics and talk about it in your social media circle. Post it on your church’s Facebook page. If the Pathfinders are preparing for a campout, share in a post about how great the program has been this year. If you and a few friends visit nursing home residents regularly, you could probably fill a blog with your experiences, ideas, etc. The same way we try to “conduct yourselves honorably among the Gentiles [public]” in our daily lives, let’s make sure that shows online as well. While it’s tempting to dive into comments, discussions, or forums and point out the flaws in everyone’s arguments, that often does more harm than good. Those posting angst-ridden content about Adventism are not likely to change their ways but to further dig in their heels. We’ve seen the miles-long Facebook “comment-versations” in which everyone throws in their 2 cents—and the original poster rarely changes his or her mind. Not always the best venue for vindication of factuality. But it’s not that we should never engage in comments or conversation. It’s possible to come “reason together” online, and on discussion/Q&A websites like Quora, even reddit or the “answers” or “groups” areas of Yahoo! or Google, there are people actively asking serious and profound questions. They want answers from real people. So if you have helpful information the asker is looking for and you can present it compassionately and casually (not in an effort to “prove wrong” or “expose error”), join the discussion. You can provide a loving contribution of information in a relevant discussion, refraining from the all-too-common emotionally-charged tactics of mudslinging, condescending language, or an us-vs.-them theme. Those qualities alone can often help your post/comment stand out! People appreciate contributors who are polite, thorough, and refrain from cryptic statements or presumptions. If the discussion is getting out of hand, or if other commenters are hijacking the focus from the asker’s original intent, you might need to decide if it’s worth your time to continue. (The NAD’s big data department provides a resource to help with this.) Or you can try sending the asker a direct message rather than adding more fuel to an already-heated thread. If you do wish to prayerfully continue in an escalated conversation, it might help to stimulate your curiosity for the commenter’s personal experience. After a person makes an inaccurate blanket statement or unverifiable claim, try asking them gentle questions as to what led them to that observation, opinion, etc. You might find a hurting individual who simply needs to vent, or who had an experience that understandably made them think that way. When people feel like others are interested in them and will listen to them, sometimes that can calm them down. Or you might find an angry mind with an axe to grind, and you decide to forego that conversation. with any of the billions of God’s children around the world.